Have you ever seen three walls on one free-kick? Can you tell what's coming? 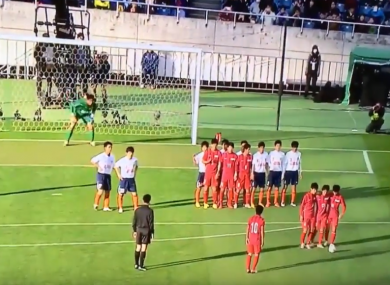 WHO DOESN’T LOVE a good free-kick routine, especially one that actually works? Well you’re in luck, because this high school team from Japan has provided you with a veritable feast for your eyeballs using not one but two decoy walls in the build up to the set-piece. Now, the defending team really should have seen what was coming but, still, credit the attacking team for the effort. The effort is a successful version of the so-called ‘Christmas Tree’ technique used by Brentford earlier this month against Birmingham City. Email “Here's your improbable free-kick routine of the day”. Feedback on “Here's your improbable free-kick routine of the day”.